I find myself revisiting a concept called revealing verticality in which spaces existing in the Z direction alters perceptions of scale and volume. I wanted to suggest that maybe lower Manhattan – not lower downtown, but lower in the sense of below the city– could form a new relationship with the planet. So, in the drawing, you see that the East River and the Hudson are both dammed. They’re purposefully drained, as it were. 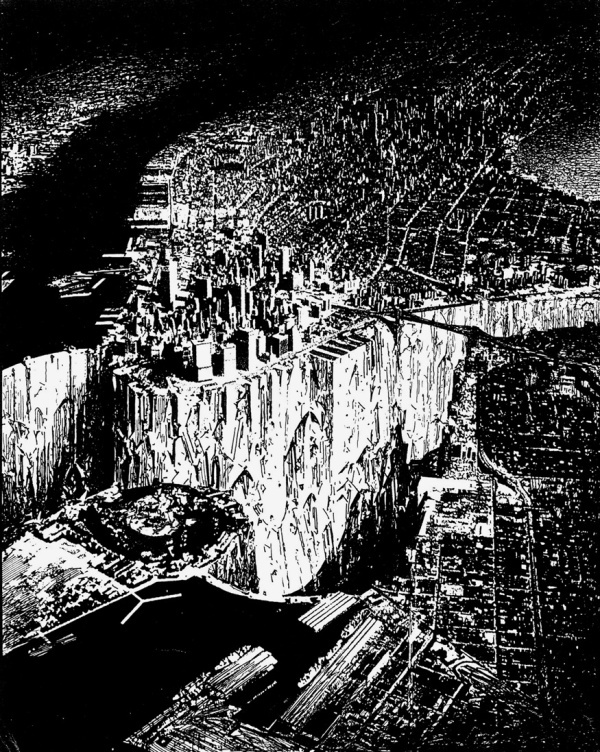 The underground – or lower Manhattan – is revealed, and, in the drawing, there are suggestions of inhabitation in that lower region.